A new skin care brand is taking the Philippines by storm. Snailwhite Moisture Facial Cream is designed to restore skin’s youthful glow. 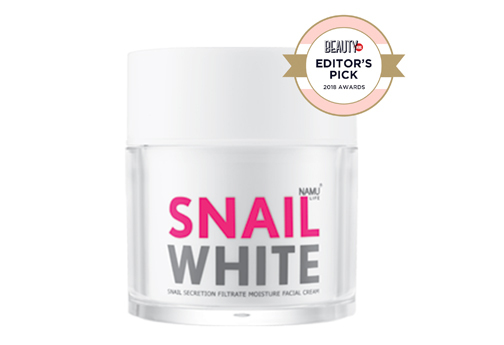 After only three months since its introduction to the local market, Snailwhite has achieved bestselling status and has bagged four awards at the coveted BeautyMNL Awards 2018. The Thai brand uses the power of Snail Potion; each product is packed with a tri-benefit formula that helps brighten, restore, and lock in moisture for healthy and beautiful skin. Snailwhite CC Sunscreen was dubbed one of BeautyMNL’s Best Beauty Products of 2018. Packed with the intensive nourishment of Snail Potion and Alps Edelweiss flower extract, this ultra-lightweight and oil-free CC cream sunscreen boosts the skin’s natural radiance for a photo-ready look. Meanwhile, Snailwhite Whipp Soap was hailed as one of the Beauty Products One Should Try in 2018. This moisturizing bar soap deeply cleanses and nourishes the face. A certified bestseller, its instant glow effect reached viral status. In fact, the overwhelming demand caused several stock-outs in the first few months of its launch. Also on the list of products that earned recognition is Shailwhite Natural White Body Wash which was proclaimed one of the Best Hair & Body Products of 2018. Packed with caviar lime and Snail Potion, this luxurious body wash helps brighten skin, bring back skin’s healthy radiance, and reveal naturally glowing skin. Snailwhite’s Natural White Body Wash, Whipp Soap, and CC Sunscreen earned recognition at the BeautyMNL Awards 2018. Last but not the least, the Snailwhite Moisture Facial Cream was included in the revered list of Editor’s Picks of Standout Beauty and Wellness Products. Designed to restore skin to its glowingly youthful state, this all-in-one facial cream melts perfectly into the skin for a truly lavish moisturizing experience. Dubbed a “wonder cream” by its fans, this cream targets several skin concerns and gives skin that signature Snailwhite glow.